Desert Orchid sadly passed away peacefully aged 27 on 13th November 2006 at David Elsworth's Egerton House stables in Newmarket. 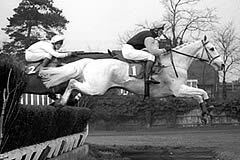 Edward Gillespie, Cheltenham's Managing Director, said today: "Desert Orchid competed at eight consecutive Festivals from 1982 to 1991. After failing to make the frame in two Champion Hurdles, he never finished out of the first three in six Festivals over fences. These included a third place in the 'Arkle', third and then second in the Queen Mother Champion Chase before his emotional victory in the 1989 Gold Cup. He returned to twice finish third in the Gold Cup. "Those statistics would be impressive by themselves and speak volumes for his soundness and the skill with which he was campaigned by David Elsworth, but it was the manner in which he competed that captured the heart of a racing generation. 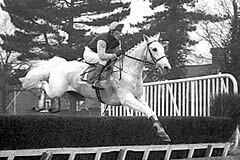 Perpetually successful around the 'park' courses at Ascot, Kempton and Sandown, his army of supporters were denied celebrations year after year at Cheltenham until he defied the most dreadful weather and the ambitions of Yahoo to claim Gold Cup glory. "After his retirement, Dessie returned every year to lead out the Gold Cup runners and was here this March to be enjoyed by his adoring public, 17 years on from that incredible day. Over 23 years since his first appearance, he has been responsible for attracting tens of thousands to the sport and the television audiences of his races have never been matched. "Racing was blessed by such an easily recognised hero who battled to the line, often achieving victory in a dramatic last stride. We were further blessed that he provided a travelling recruitment campaign with his racecourse and other public appearances to meet a wider audience. He is remembered at Cheltenham by the name of a grandstand in the Best Mate enclosure, alongside Dawn Run and in a hologram in the Hall of Fame. "Desert Orchid has left the sport which is far stronger than the one he joined, due much to his own achievements and the involvement he demanded of his audience."